There are certain places that come to represent not only a location but an era of time. For anyone that has a relationship with Hip-Hop, Fatbeats was one of those places. The indie record store/label became a household name for what was hot in hip-hop. It was the place to get dope, underground music. It was where artists congregated over music and tickets to the best shows were sold. It was a key corner in the hip-hop culture of the cities it occupied. and now they are shutting their doors (thanks internet for ruining the music industry). But not without a bang. 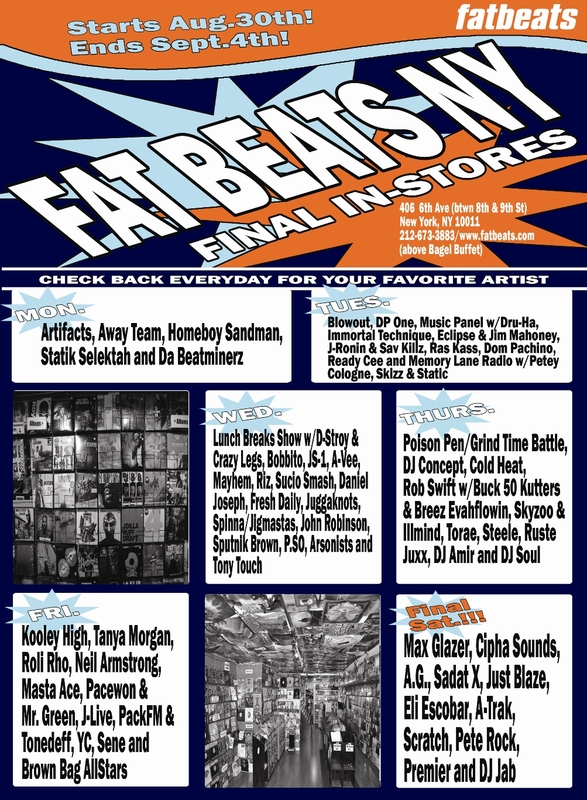 All week leading up to D-Day Fatbeats will be hosting in store shows as part of their official sendoff. And the best part: they are free! check out the schedule on the Fatbeats website to see when your fave emcess/producers are stopping by.